"Early Childhood Family Education (ECFE) is a program for all Minnesota families with children between the ages of birth to kindergarten entrance. ECFE is based on the idea that the family provides a child's first and most significant learning environment and parents are a child's first and most important teachers. ECFE works to strengthen families. ECFE's goal is to enhance the ability of all parents and other family members to provide the best possible environment for their child's learning and growth." (Early Childhood Family Education. Retrieved November 11, 2015, from http://education.state.mn.us/MDE/StuSuc/EarlyLearn/ECFE/). Kimball's ECFE program offers several parent-child classes each year. A combination of morning and evening classes are offered. There are also several weekend opportunities and other special events offered throughout the year. Celebration of the Young Child! Join is in celebrating the wonder that is early childhood! 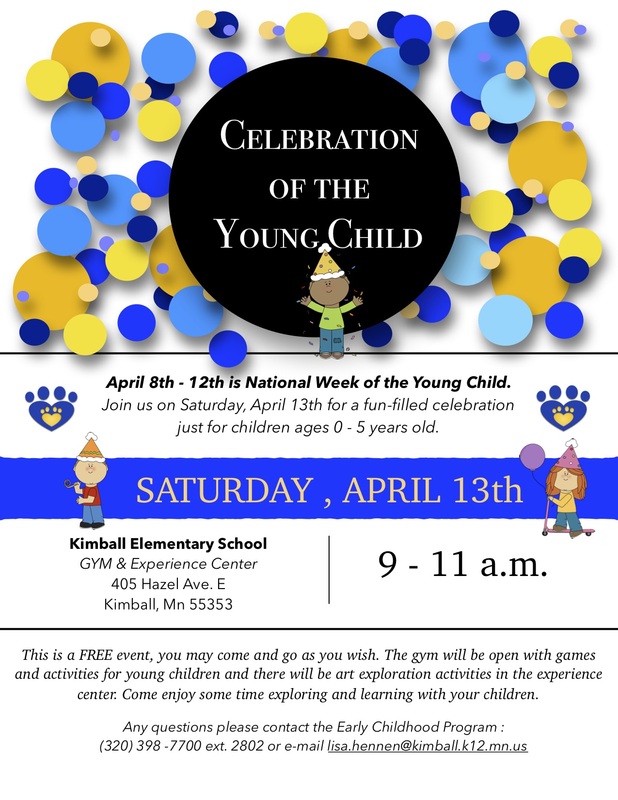 April 8th - 12th is the Week of the Young Child and we will be celebrating this wonderful week with special play date at the Elementary on Saturday, April 13th. * This is a FREE Event to all children ages 0 - 5 years old and their families. We will have games and activities in the gym and art exploration activities in our experience center. Come join us for some fun. Location: All classes are held at Kimball Elementary School in Room K3. A 1.5 hour long, traditional morning ECFE class for families with children ages 6 weeks to 5 years old. This class encompasses art exploration, child led play time, a teacher led circle time, and a half hour of parent education time. A 1.5 hour long, traditional evening ECFE class for families with children ages 6 weeks to 5 years old. This class encompasses art exploration, child led play time, a teacher led circle time, and a half hour of parent education time. Tuesday's: 6:00 - 7:30 p.m. This is a parent-centered class. Parents will be engaging in an hour discussion on how to build secure relationships and foster healthy development with their children. Children under 5 who are comfortable separating from their parents are invited to attend. Their will be gross motor activities and child centered experiences led by an early childhood teacher. Tuesday's: 6:00 - 7:15 p.m.
Get ready to be messy! This class is all about exploring with our sense through play. There will be different sensory materials for your child to experiment with, and use to create or make art. Come enjoy the worry free mess, at school. Tuesdays: 6:00 - 7:30 p.m.
A sliding fee scale is used for classes in which payment is required. This means that the fee is based on family income. No family is turned away due to inability to pay! Registration Pre-registration is required for ECFE classes. Please click here to download our ECFE registration form and mail into our office. Even if a class has already begun, you may be able to register and join if there is space, so please do not hesitate to call. Because of the nature of the classes, classes with fewer than 4 families registered will be canceled. Please register early so we can best prepare. Kimball ECFE offers free home visits to families with young children. Just call the office to schedule a home visit. New Baby Packet or Visit! If you have an infant contact our office for a free Welcome Baby visit. These are short 30 minute visits, that provide you with a welcome gift from our program and share with you want support and resources are available to you and your newborn child.